A grower and a customer hug at one of the most popular flower shops in the Market. iting into a sun-warmed, ripe peach from the Marin County Farmers’ Market at age 6 is one of those memories for me — those visceral, all-consuming recollections — that makes me feel like no time has passed since my mom happily pulled me by the hand through the stalls. The farmers’ market, a quick bus ride away from UC Berkeley and open Sundays 8 a.m. to 1 p.m., has been around for about 30 years. Either the second- or third-largest farmers’ market in California (as disputed by different farmers playfully bantering between stalls), it’s located right next to the Marin Civic Center in San Rafael. The market serves as a gathering place for farmers, vendors, community members, musicians and families alike. The value of the pure farm-to-table transaction has been widely accepted in Marin County; this movement toward local food and sustainability has been eaten up by health-conscious families in America’s eighth wealthiest county. But the idea that farmers’ markets are these bougie things is oft a perception perpetuated by the $30 local cheese or big sun hats reminiscent of southern derby apparel — and it’s only partially true. Sure, Healy mentioned that some of the best (and most expensive) restaurants in the Bay Area shop at the market. “There are probably half a dozen or more Michelin star chefs that are shopping here,” Healy said. While Healy thinks that society rightfully holds these chefs — who bring local food to the masses and help people appreciate good food — on a pedestal, he wishes that the farmers who are providing this food would get some more credit for it. Furthermore, according to Healy, the accessibility of the market is something of which to take note. Biting into a sun-warmed, ripe peach from the Marin County Farmers’ Market at age 6 is one of those memories for me — those visceral, all-consuming recollections — that makes me feel like no time has passed since my mom happily pulled me by the hand through the stalls. In regards to fruits and veggies, the market has surprisingly great rates on produce. Healy explained that “farmers come direct, so they can both get a higher margin while offering it at the same price or less. So it really is affordable, especially with the EBT match and the WIC dollars.” WIC refers to the Special Supplemental Nutrition Program for Women, Infants, and Children, funded by the United States Department of Agriculture’s Food and Nutrition Service. Healy said the Agricultural Institute of Marin is also working on a mobile farmers’ market project, in which goods from the market would be packed into a special truck and driven into neighborhoods with less access to fresh fruits and vegetables — areas most commonly known as food deserts. Healy also hopes that, in the future, the market can transform from its current state (as stalls in an empty parking lot) into a more permanent establishment. He said the Agricultural Institute of Marin has already designed a structure and gotten approval from Marin County voters to use the land for the ambitious project. Many market-goers flock to the Bolani stand to get a free sample from the enthusiastic team. Rainbow chard is abundant at the Market. Customers of The Peach Farm conversed with the farmers as if they were long lost family members; inquiries about apples were peppered with questions about their kids. Lots of little kids come for the flavored honey sticks. Marshall’s Farm Natural Honey offers many organic honey options as well. Fresh fruits and veggies are around every corner! 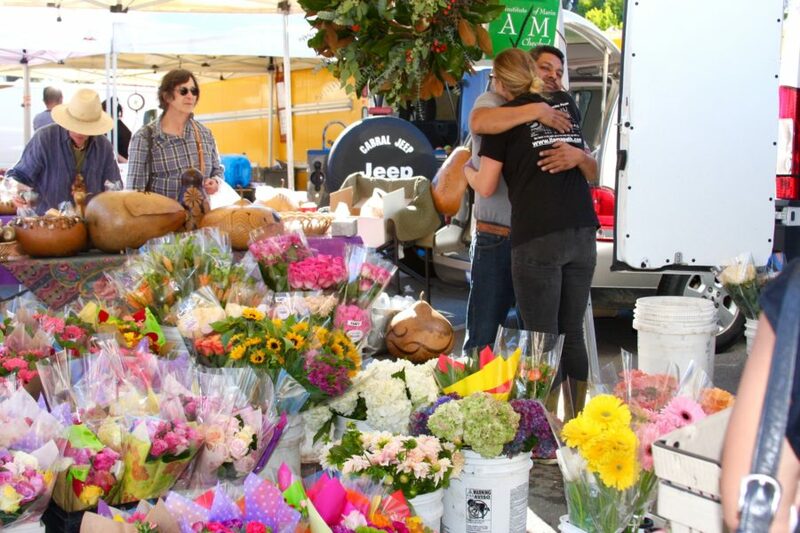 One of the owners of Beber Almond Milk, Arielle Danan, said that in addition to their very own small batch unpasteurized almond milk, the Marin County Farmers’ Market is home to the best of California’s growers and makers. Pomegranates and dried fruit are also popular fare at the Market. Dan Saldal (the hands on the left) of Point Reyes Farmstead Cheese said the people are the best at this market; they’re fantastic, and that’s what makes this his favorite market!